Apart from the main house, there is a separate building on the premises. 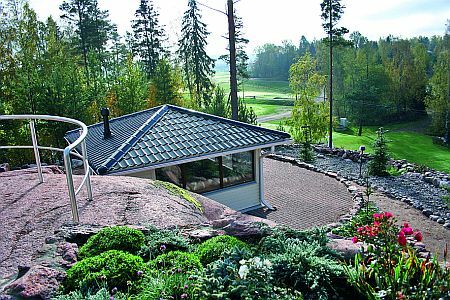 There you can find a wine cellar, a gym and a spacious two-car garage. The house is built on a wooden frame, decorated with white bricks and a black tin roof. The house is 99 m2 in total area and has electric heating, wireless remote-controlled lamella doors, and TV and radio connected to the antenna network. There is also a 9 square meter wine cellar with space for ca. 600 bottles. 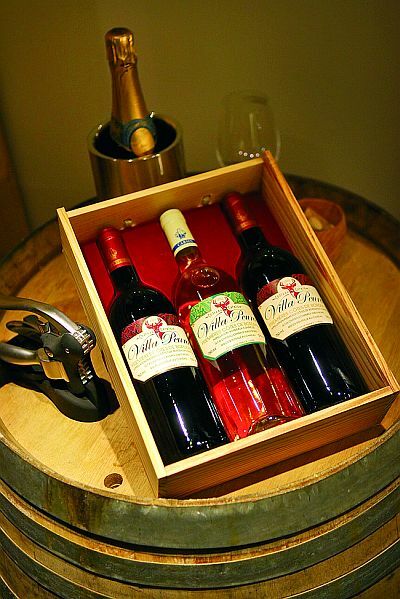 The new owner of Villa Peura will acquire the possession of the vinebottles that are in the cellar now, part of which is the house’s own Bordeaux from the estate of Chateau Carsin. The 25 square meter gym is equipped with a wide selection of appliances and adjustable lighting. Outside there is an insulated, wood-heated 1,200 liter bathing barrel. It is made of stainless steel and seats 4-6 bathers at a time. There is also a 12 m2 lighted pool in the yard, equipped with a quartz sand filter and water recirculation. The 15 square meter maintenance room is where the oil burner, water boiler and switches for heating and water circulation are located. There is also a separate storage room with two 1,500 liter oil tanks. The room is equipped with an automated water treatment system, which makes regular tap water as fresh as spring water. The grill house seats 6-8 diners, is built on a wooden frame and has a wooden coating. Inside the 16 m2 house you will find a tiled floor, adjustable lighting, gas stove with a cooker hood, and a refrigerator. Ventilation is taken care of by a ventilator in the top of the ceiling. In addition to the grill house, there is also a separate outdoors fireplace and grill in the yard. Around the house and in the yard, there are six separate terraces, 300 m2 in total area: the waterfall terrace, the gym terrace, the barbecue terrace, the morning coffee terrace, the lounge terrace and the pool terrace. In the inner court terrace, there is a 17 square meter decorative pool with a 2.5 meter tall, illuminated waterfall.